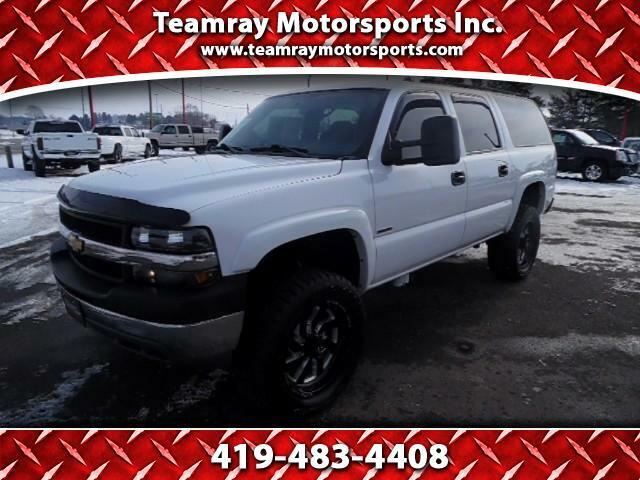 Used 2004 Chevrolet Suburban Sold in Bellevue OH 44811 Teamray Motorsports Inc. Brand new custom leather seating, brand new carpet, 64mm BD Diesel Turbo, PPE exhaust Manifolds, EFILive tuning, South Bend dual disc clutch, FASS lift pump, Edge CS2 monitor, 3" lift, 20" Fuel wheels with 305/55R20 Toyo R/T tires, custom stereo with subwoofer, and much, much more! This is a 585hp truck and is the only known Duramax-swapped Suburban with a ZF6 manual. This hard-to-find SUV will haul any trailer you want to pull along with 8 of your closest friends! WE DO HAVE SEVERAL FINANCING SOURCES FOR LESS THAN PERFECT CREDIT THAT GIVES US THE POWER TO GET ANYBODY APPROVED ON SOMETHING. MAYBE NOT THIS VEHICLE BUT WITH 100 UNITS IN STOCK WE HAVE SOMETHING THAT SHOULD WORK FOR YOU. FILL OUT A CREDIT APP OR CONTACT KYLE AT 419-483-4408 TO GET APPROVED ON SOMETHING TODAY!! MAKE SURE YOU ALWAYS CALL FIRST BEFORE MAKING THE TRIP. IF WE DON'T HAVE ANY PICTURES IT IS JUST A NEW UNIT THAT STILL NEEDS TO GET THROUGH OUR SERVICE DEPARTMENT AND DETAIL. IF YOU HAVE INTEREST IN SOMETHING WITH NO PICTURES JUST GIVE US A CALL AND WE CAN PUSH IT THROUGH FASTER!!! GET IT READY IN TIME FOR YOUR ARRIVAL.